1. DUMB TONY ROMO screwed me. I hate him, I hate the Cowboys, the end! I lost to my mom in Fantasy Football this week, MY MOM! 2. We had Jackson's parent-teacher conference this morning, and the words, "He is my star!" seriously crossed the teacher's lips. She gave this glowing review about how bright he is, but more importantly she said that she has never heard a mean word cross his lips! WHAT KIND OF FREAKING drugs do these teachers who have him take!!!???? I am convinced I need to record him at home so they can see him here! OMG! I love him, and I know he is bright and well behaved at school, but could I get a little of that at home! 3. The love of Tyler's life is coming home with us after school today! Please take a moment to visualize all three of us walking to the bus stop and then all four of us walking home. Do I have to wait for him to go home before I start drinking!? 4. Our pumpkins are growing mold, and as with most things that have mold, I want to throw them out, but really, they should be ok until Sunday night, RIGHT?????? 5. Do you think all the Vaseline we slathered on them to preserve the carving added to the mold growth? We have the shiniest pumpkins on the planet right now! 6. I have decided that this will be the last season I watch America's Next Top Model. I don't really get the whole posing thing, and I don't really care if you had a baby when you were twelve, and you are doing this so that they are proud of you. Honestly, I feel old stating the above, but it is just NOT ENTERTAINING TO ME ANYMORE. Tyra and her circus clowns are no longer entertaining. 7. It is soooooooooo hard to get a doctor's appointment between the hours of 9:30 and 12:30 in a timely manner. 8. Pat has six days in a row off at Christmas. Since Tyler has been born, the four of us have NEVER spent six days in a row together. We are certain to kill one another. CERTAIN. AND, if we have spent more than two days together, we have been on some sort of trip-time to start planning some activities. 9. Took Tyler to breakfast this morning. . .Scramble was NOT GOOD! I had a terrible experience there, SAD! 10. Finally, number 10, I have been struggling with what to write, so needless to say, I am VERY happy to see #10! A GEM! A true gem right in the middle of the business district on Central! Just a little south of Indian School is a street called Clarendon, at Clarendon and 4th Ave, there is a TREAT! The Clarendon Hotel has a restaurant in it that is called Gallo Blanco. If you get Phoenix Magazine, (which I HIGHLY RECOMMEND YOU GET IF YOU LIVE IN PHOENIX-MY FAVORITE), you have stared at the Gallo Blanco tacos since their Best of Phoenix issue came out in early September! The picture is worth ONE THOUSAND WORDS! 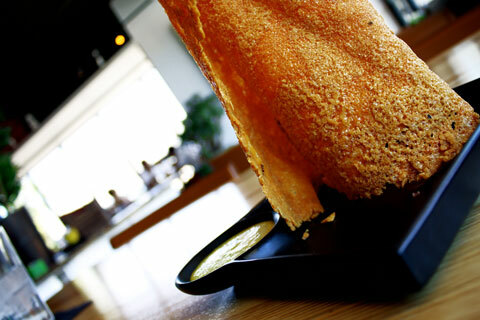 So thankful that B Mok Revealed had a picture of the appetizer we started with-Chicharrón de Queso! IT WAS AMAZING! The cheese was like the cheese that oozes out of the side of a quesadilla and browns, then they roll it into this tower and serve it with the jalapeno dipping sauce (also known as Aji aioli sauce, but since most of us don't really get a clear picture from that title, I like mine better! )-TO DIE FOR!!!!!!!!!! Then, we should talk about their ALCOHOLIC BEVERAGES. . .we all enjoyed their FABULOUS margaritas, made with fresh fruit juices and fabulous tequila, but what should REALLY be talked about is the sangria with all sorts of fresh fruit cut up and marinated in the delicious concoction!!! YUM! So I was finally given the chance to taste the tacos! HEAVENLY, and I love their presentation, they just put them in these taco holders, and the table has to remember what they ordered and divide them up! So cute and fun, very sushi like! I tried the carne asada, pork and fresh fish (ahi tuna)! They each had a VERY unique flavor, and I don't think I could pick a favorite. I am disappointed I didn't try the shrimp because my friend Andrea stated it was her favorite, but now it just means I need to go back! Their green salsa is delicious and the closest thing I have found to my favorite breakfast taco place in San Antonio. My friend, Tamara, had Ensalada Cortada which was the tossed salad with many ingredients, but the most important being the corn nuts. She gushed about the corn nuts with each and every bite. She said the corn nuts MADE the salad, and in my opinion, corn nuts are a GREAT addition to each and every dish! I LOVE CORN NUTS! dollop of whipped cream on top." BUT WAIT, the review doesn't stop there, we happened to go on a Wednesday night, and the place was PACKED. That's because on Wednesday from 7-9 they have Flamenco dancers come and perform. It was great fun, and the dancers really have a lot of talent. I know I will definitely need to go back because this place serves breakfast ALL DAY, and in my opinion, breakfast is the best meal of the day! Can't wait for my return trip! We had sooooooooo much fun yesterday, and it was TOTALLY unexpected fun! Jackson had a BINGO night at his school Friday night, and he didn't go to bed until TEN! So, needless to say, he was EXHAUSTED on Saturday. We had plans to go to Ocktoberfest downtown at Cityscape, but there is no way he would have made it and been pleasant, so we altered our plans and carved/painted pumpkins after a short nap. I had big plans to do a Hannah Montana pumpkin for Tyler, but I was not a fan of any of the patterns, so I chose a Hello Kitty pumpkin instead. Jackson's was a Mario pumpkin all the way! I like to think that Pat and I have MAD pumpkin carving skills, but once you've carved one pumpkin, you can pretty much do anything! While Pat and I carved, the kids painted their pumpkins! I think I was prepared for the girls to have on crazy outfits, but the MEN were EQUALLY as crazy. I don't know how many blond hair men with bandannas and straw cowboy hats were there! Seriously! It was PRICELESS! I will completely admit that I had tears in my eyes when he hit the stage. It was just so amazing to see him rocking out after having a stroke! Medicine at its very finest! I will also admit that I was scared I was going to get beat up in the bathroom because I don't think a lot of the people attending the concert had fallen in love with him on Celebrity Apprentice like I did! HA! I have never been to such a RIDICULOUSLY loud concert before. My ears are still bleeding today! The drum was seriously like jiggling my belly fat! And the couple who was making out in front of us! OH MY GOD, I could just seriously go on for days about the people watching! I have been MIA for a bit. Jackson was on Fall Break last week, and we have been busy eating our way through the Valley. No seriously, the kid and I can eat! Two weeks ago we had the craziest hail I have EVER SEEN in my life. I have never seen anything like it. I was driving to pick up Tyler, and I had to pull over a gas station awning because the hail was the size of golf balls. It was beating down on my car and scaring the crap out of me. The hail wasn't the size of golf balls by my house, but I took some pictures of the massive amounts of hail we had! The quality is not the best because it was my cell phone, but you can get the idea. We also celebrate Tyler's 4th birthday this past weekend. She wanted everything Hannah Montana, and on your birthday, your wish is my command. We also hit the horse races that day per her request! She was one very happy little girl! Wednesday I took Jackson to his first tasting at Z'Tejas. We were tasting the winter menu. It was a little spicy for him, but he was a trooper and tried everything. I was so proud. Thursday I took him to Cracker Barrel for breakfast as a reward for behaving so well at the tasting. His meal cost ten dollars, and I couldn't even complain because he ate the whole thing. I learned my lesson though, and we won't be returning to Cracker Barrel for a while. I am NOT a fan of their combination plates. I had to add a bunch of stuff on and it ended up being rather expensive. BUT, the hashbrown casserole is just SO GOOD THERE! Mmmmmm! This past weekend was very dull, but it was exactly what I needed. This last picture is just because I thought it was funny. My sister and I were driving to lunch one day, and this thing was just standing on the corner by her house. WEIRD! UPDATED: 10/7/10 crossed out items have been purchased! 1. ANY DS game! Currently he REALLY wants the Toy Story 3 game, but anything with Mario would make him happy! 3. Gift Card/Certificate to McDonalds, Sonic, or the Movies. 6. The Penguin Boat from Batman that goes along with the Imaginext Batman play set. 10. A big screen tv. . .OH WAIT THAT'S ME, but I think he would like it as well! Honestly, Pat and I must be AWESOME at opening gifts, because no matter what you get him, he will love it, and when he opens it, he will make you feel like you bought him the best gift in the world. Again, variety of prices so there is something for everyone. I don't know who would buy the tv, but you never know! HA! As you may know, I support Step Up Women’s Network – the national nonprofit that connects you to the professional women you need & underserved teen girls who need you. We need your (digital) help now more than ever! Step Up is up for a $250k grant that would help us fund after-school programs that help our underserved teen girls become confident, college-bound and career-ready through the Pepsi Refresh Project. Through October 31, please vote three times per day via the website (http://pep.si/ci154d), facebook, and text (103315 to 73774). There is no charge to vote (other than your standard text rates) & it takes just a moment. One minute of your time could add up to $250k for teen girls nationwide! A sincere thanks for support of this important cause I am backing.